I love voxel graphics and this looks like a lot of fun. Following! Cool stuff, can you say a bit about the direction of the game/gameplay experience? The back bone of the game is Ikari Warrior/Heavy Barrel style gameplay. Lots of running/driving around and shooting. There will be a story but it's not critical to the experience, so no cutscenes! The story is there to create a coherent world but who cares when you're going to destroy most of that world anyway! In addition to the basic gameplay we're adding an exploration element. Because the player can explode the world we want them to want to explore to reveal pickups, paths, secret areas, easter eggs and anything else we can think of. What better way to explore than with a grenade or rocket launcher! Multiplayer will be 4 player coop on the same screen and over the network. We're very early on though and we keep discovering new ways to play with the voxels so it might change a bit but we're going to stick to the Twin Stick arcade style experience because that's what we enjoy playing. We might release the editor as well so people can create levels and share but we're not sure about that side of things yet. Hope that's enough to whet your appetite? 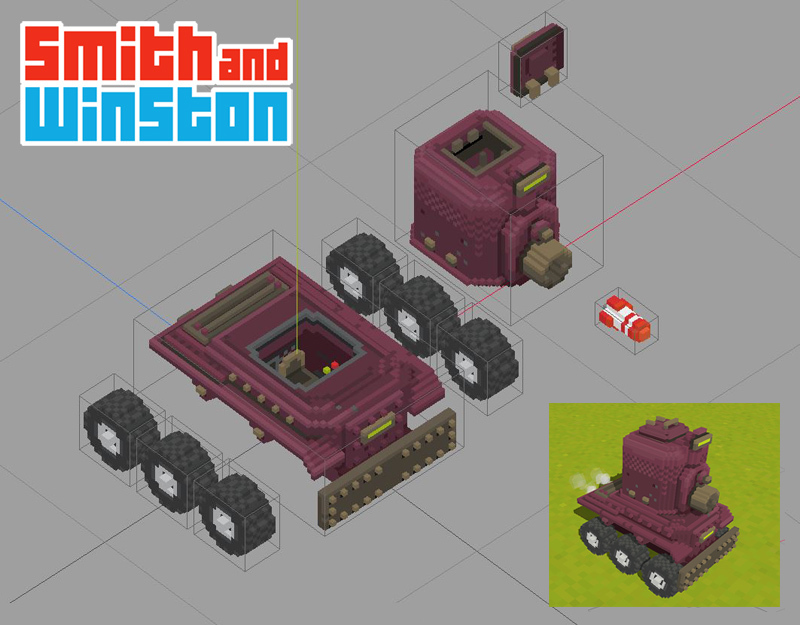 As mentioned in the previous post we're working on drivable vehicles, here's a quick peek at one of our new tanks. Looks like tons of fun, and by far the best visual style I've seen in a voxel-based game. How are you rendering the voxels? .....the computer is just a toy, you are the tool. We use PolyVox to manage the voxels. The world is chunked in to 16x16x16 voxel blocks and we build models from that to render. PolyVox provides a mesh extractor so it's pretty easy to get up an running pretty quickly. We've not experimented too much with the chunk size yet, we've just got it working. It's likely that 16 isn't the most optimal chunk size but it's good enough for now. I've always loved voxels (Outcast is still one of my favourite games) and this looks awesome! That would be a good day to die. I know it sometimes borderlines obvious territory, but still a good source of inspiration. Another question: have you tried forcing the voxel cubes onto the low res voxel grid? I mean, what if the cubes can not roll and move in the full resolution, but instead they can only move on the 16x16 cube grid and can not roll at all. I think Voxatron does a similar thing, where the smallest component of the playing field is a voxel and there is no further detail or movement inside 1 unit. I hope you get what I mean. Great job on the detail! I've noticed a lot of voxel games skimp on voxels. A lot of their models have low voxel counts and look pretty boring. That's not the case here. The spider shown looks amazing. We haven't tried locking the voxels to the grid. Right from the beginning we wanted the more free form explosions that a physics system gives you. We do lose some of the 8bit charm that that style offers but we feel we gain a lot by exploiting the feel of the physics engine. @ Batowski Cheers for the link, I've probably watched that video about half a dozen times now, its a great guide and set of tips from someone who knows their stuff. I'm also a big fan of their game Nuclear Throne, which according to steam I've played for 32 hours now, yipes, its bit hard though. Yes, thank you for such a thorough response! Have you considered using hardware skinning? With effectively one bone per vertex, it seems a trivial case for the technique. Also, in my tests simple DDA raycasting on the GPU is very fast with modern hardware. Might be worth experimenting with for boss characters & the environment, though you'd lose MSAA and it's not straightforward to reconstruct depths. You know, I hadn't even considered Raycasting. My initial thoughts are: Intel GPUs are so bad that it's hard enough to get them to render triangles correctly let alone run sophisticated Vertex/Fragment shaders in real time. But I may be wrong I'll add it to my research pile.